Often industrial sewing machine operators may want to reduce or increase the speed of their machine depending on user preference or a change in fabric being worked on. Reducing the speed of a machine allows more precision for working on intricate detail as well as for working with heavier weight materials such as leather and canvas. Having slower speed is important if you want to work on heavier materials so that you prevent breaking needles and threads. Also for the beginners of industrial sewing machine, it is very necessary to slow down the speed of machine. Increasing the speed of a machine is often acted because operators are working with lighter weight fabrics and want a fast output. High speeds are often associated with the clothing or fashion industries where the same pattern is being completed continuously. The great thing about industrial sewing machines is how to slow down speed of heavy duty sewing machine. If you are still using clutch motor for your industrial sewing machine, it is time to upgrade with a servo motor. There many power-saving motor in today market. If your machine is heavy duty industrial sewing machine, you need a powerful servo motor. HighTex HVP-70 is a strong servo motor (Powerful + Quiet + Accurate Speed Control, different from so call "Energy Saving Servo Motor"or "Power Saving Servo Motor" in the market. You just pay a hundred of US dollar now and make it back within one year, because this sewing machine servomotor can save electric up to 60% to 80%. Another very important feature advantage is the speed is various from 100-4800 RPM!! So you always cat sew at desired speed according to the thickness of material. 2. Change the hand wheel (flywheel) of industrial sewing machine. The cheap way to slow down your industrial sewing machine is to use a bigger flywheel of the machine. But in practice, it is not easy to get a bigger or heavier flywheel. The hand wheel of sewing machine usually made of casting iron or aluminum that made by mold. The sewing machine manufacturers will not help you custom made a heavier hand wheel. If you are lucky, just using Juki TSC-441 leather sewing machine or the Chinese clone machines, we have 12 inch Mega Flywheel for this type leather stitching machine. This large flywheel not only can slow down the speed of leather sewing machine, but also create more torque for very hard and rigid leather for saddle makers and harness makers. This flywheel is the largest flywheel of its kind. 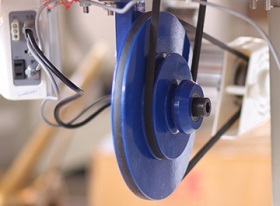 To use a small pulley of the motor, can reduce the speed of industrial sewing machine. 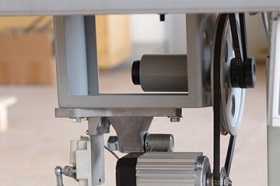 The diameter of motor pulley is various from 45mm to 80mm. HighTex HVP-90 servo motor standard supplies with 50mm pulley. If you want to greatly reduce the sewing speed of your leather sewing machine, it is better to purchase a speed reduce that be installed under sewing machine table, between machine hand wheel and motor pulley. The sewing machine speed greatly adds torque and allows you to gear down sewing speed from 1/3 of your machine's rated speed. HighTex is the leading manufacturer of speed reducer for heavy duty industrial sewing machine, in past 15 years, we designed 3 type speed reducer for different leather sewing machine. Below is the hot sale speed reducer in today market. If you have any additional question or concern, please contact us at info@automatic-sewing.comthanks!